I don't bake many sweet things anymore, but once a year or so there is a Cake Occasion. On such occasions, I make gingerbread. My birthday is a sort of makeshift affair. My favorite cake is gingerbread with chocolate icing, and I make the cake the night before. Sometimes I make two layers, and sometimes I split one. When the cake is cook, I spread the middle with a very, very thick layer of raspberry jam and stick the layers together. The top is spread with a thin layer of jam and the cake is left to stand, uniced, overnight. The next morning I make a plain butter, sugar and chocolate icing—any standard cookbook will give you a recipe with proportions. Well, my gingerbread is a simpler thing, but I've always meant to try it her way. For me, I follow the recipe in the 1975 Joy of Cooking, except I use Ceylon Cinnamon (I just like the flavor; don't know why), and I increase the amount of ginger (at Laurie's suggestion). I drizzle a lemon glaze over the top, which is just powdered sugar mixed with enough lemon juice to get to a drizzling consistency. Last week, as I made this, I thought I might write a post about Laurie and gingerbread, but then got busy with other things and lost the momentum. So it was a happy surprise and coincidence that last night, catching up on blog reading, I found that Kate had written about Laurie Colwin. It truly is a small world. I've had lots of fried green tomatoes with a heavy coating of breading on them, but I don't do it that way. Step 1: Find a nice green tomato. It should be fairly firm, but getting towards ripening. If it's too soft, it will fall apart when prepared this way. Step 2: Slice the tomato somewhat thinly, 1/4 inch or less. You want it to cook through before the coating burns. Step 3: Dredge the sliced tomatoes in seasoned cornmeal. I mixed cornmeal, ground red New Mexico chile (semi-hot), and salt. A bit of dried thyme is nice too. There should be enough moisture in the tomato slices to make the cornmeal stick. You don't want it too thick, so brush off any excess. Step 4: Heat olive oil (or other good-quality oil) in a frying pan over medium heat. When it's hot, add the tomato slices. Cook on each side until golden brown. Step 5: Eat as a side dish, or make a fried green tomato BLT. Last weekend we used a Cherokee Purple for this and the flavor was excellent. The previous weekend, we used a Black Russian and it was insipid. I'm not sure if we just had a more ripe tomato the second time, or if the difference was due to the variety. The luxury of fresh herbs inspired this omelette. I've made this for 2 weekends in a row. Will it be 3? Step 1: Gather fresh herbs. I used about 2 or 3 sprigs of tarragon, 2 or 3 sprigs of chervil, 4 or 5 parsley leaves, and smaller amounts of dill, chives, and lemon basil. Step 2: Chop the herbs finely. Step 3: Make an omelette in any way you like. I melt a bit of butter in a 12" non-stick skillet and add a splash of olive oil. The add 4 beaten eggs, and push the cooked egg around a bit to let the uncooked egg run to the bottom of the pan. If I knew how to make an omelette in the classical French manner, I'd do it that way. There's a good description in Julia and Jacques Cooking at Home, but I've never mastered it. Step 4: When the eggs are almost set, sprinkle the chopped herbs on top, along with salt and freshly ground black pepper to taste. The amount of herbs after chopping was about 2 to 4 tablespoons. Fold the omelette in thirds, as if folding a letter. This is two servings in my view, so I cut the omelette in half for serving. Last week, I had some onions I wanted to use up, so I added a small amount of sauteed onions. At long last, we got to eat something from the garden other than herbs. It would still leave you hungry, because it was still just seasoning, but it was actual fruit - not leaves! First, I made the relish. 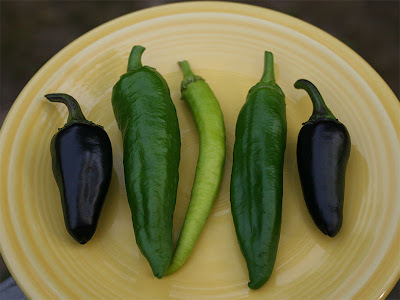 I finely minced five assorted chile peppers (that's the garden part). These were only mildly hot, so I left the seeds in. Then I finely minced some yellow onion; the amount was roughly equal (or a little less) than the amount of the chopped chiles. I cut a few coriander leaves (cilantro) (there's the garden again) and minced those finely. Mixed everything in a small bowl, and added lime juice and salt to taste. I cut up some pork chops into carnitas-sized pieces, approximately half-inch dice. Tossed the diced pork with some soy sauce, sliced garlic, and lots of black pepper, and set them aside for a while to soak up the seasoning flavors. Then I put the pork on flat metal skewers (leaving the garlic behind in the bowl), and grilled it over charcoal until crispy. We then assembled tacos from the meat, relish, some romaine lettuce, and flour tortillas. Verdict: a winner, but the chiles could be hotter. For many years, we've enjoyed Vietnamese Summer Rolls in restaurants. I gave some thought to learning how to make them myself, but always imagined that working with the rice flour wrappers would require more skill than I was likely to develop. Then a few weeks ago, I read a post by Nupur at One Hot Stove, and she made it sound really easy. So last night I decided to try. I made them pretty much as Nupur did, but I didn't have any cilantro/coriander on hand, so I left it out. They turned out well, I thought, for a first effort. I'm going to tweak it a bit next time. I'll probably make a hoisin-based sauce for dipping, and not bother with preseasoning the tofu before frying.